Join the discussion on our forums! Come discuss Akali, the Rhino over in our dedicated Akali, the Rhino discussion topic. If you can kill something for 1-2 mana in warrior and instead choose a 8-mana option to do it, then yes, you took a tempo loss. 10 - 2 = 6 mana lost on that turn. Simple math. What makes it even worse is that your max target health that you can kill is 5. That's bad tempo and bad flexibility. Works without using rush deck. Pulled a golden one from my preorder bundle, looking forward to trying it out! So where's the True Stealth smoke ring? with the Spirit this is great, especially since you can also pull it from Oondasta and then ahve a big rush boi to follow up on the next turn. I see this card as a fast Don Han'Cho that draws you a card. Which is great! I'm only agreeing with the first half of your comment. Theoretically, this is insane with Dead Man's Hand. When you get to 0 cards in your deck, two DMHs, and an Akali, the Rhino in your hand, you get a copy of your hand back in your deck along with an initial 5/5 with Rush followed by 10/10s with Rush each remaining turn. Warrior is also pretty proficient at drawing 30 cards in less than 10 turns so there's that. wtf man. are u high? Refer to my reply to AliRadicali. I have no idea what is going through your head nor do I understand what you are saying, but it's okay, we all have our brainfarts. I think Akali, the Rhino is bad to borderline playable, although it's pretty expensive which I think is going to hold the card back from seeing play. Dealing 5 damage on turn 8 (let's be honest, you're probably going to lose the minion as it attacks), taking up your entire turn, is pretty low tempo, and it's not clear to me without some playtesting whether that +5/+5 minion will gain it back on the next turn (probably not, let's be honest). I'd also like to point out that if your opponent doesn't have a minion you can kill with this, this card is just a 5/5 Rush for 8 mana. The floor with this card is pretty bad. Having said that, if you do kill a minion, there's a ton of amazing targets, Redband Wasp, Vicious Scalehide and Zilliax are all pretty great targets, including other rush minions that wouldn't be "bad" by any means. The 2-mana targets in particular allow you to roll out 2 minions on turn 10. 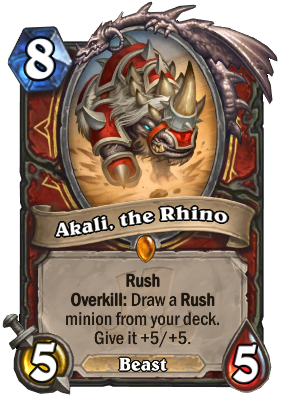 Because of these best targets, this tells me that Akali, the Rhino wants to be a late-game play in a rush aggro deck, but will it be enough to seal the deal when your deck couldn't get it done? Probably not :/ I don't think you can count on this card with only Zilliax in your deck either. It's ok... it's not that OP. the tempo lost from playing this card is not to be ignored, and it's not clear to me that you can make it back with a +5/+5 Zilliax on the next turn. On it's own it's not crazy but if you build a deck around it... It might stomp really hard. I am looking forward to it.